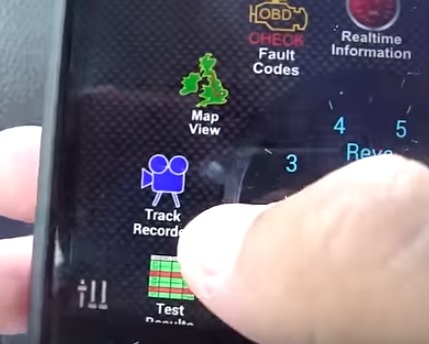 Using a Bluetooth scan tool with the OBD2 port in a car or truck allows you to read the vehicles information and give you the data in real-time. The adapter is paired with your smartphone and plugs in under your dash of your car into the computer OBD2 port. 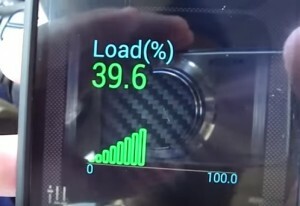 It pretty much reads the data transfers from your car to your phone and allows you to see real time information abut how your car’s performing. 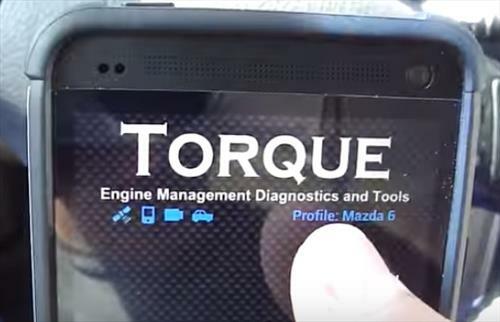 It also gives you insight into any check engine lights that may be on and any error codes. Allowing you to clear them if necessary among many other things. Here we are going to give a overview of the small OBD2 Bluetooth device itself, and then take it to a car to show how it works. The scan tool used here is the OBD2 Bluetooth tool called the ELM 327. There are other Bluetooth scan tools available but the Elm 327 is possibly the most popular and low cost. It is a small device, basically needing only the electronic components to decode OBD2 signal and transfer it via Bluetooth to a device such as a smartphone or laptop. We don’t need anything complicated just something simple low cost and able to communicate with a phone or laptop. 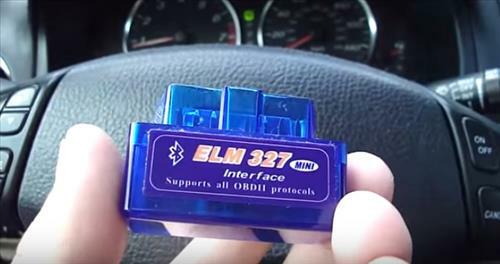 The ElM 327 interface is a micro controller used by many scan tools to to decode OBD2 signals. This version is smaller than other models, making it easier to drive with since OBD2 ports are under the dash a big scan tool can get in the way when driving. The build of the unit itself is a see-through blue color which allows the components inside to be visible. 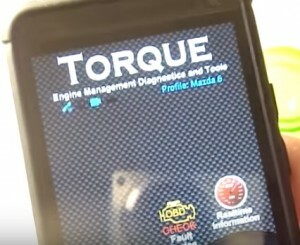 The user side is after being plugged into the OBD2 port uses the Torque app which allows you to read error codes, clear codes, and show real-time data. 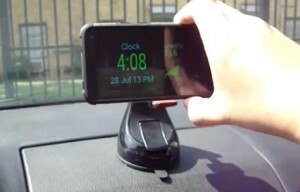 It is a very simple device to use so lets plug it in and show real time information that will be displayed. Here we are on the inside of a mazda6 to use as a test vehicle. The OBD2 Bluetooth controller plugs in under the dashboard. I also wanna make the point that there’s a circuit board inside and so you don’t want it to get hot or at least too hot. Basically keep the heater to a minimum or be sure the car hasn’t been sitting in the sun all day. This will keep the device cool and able to run correctly. 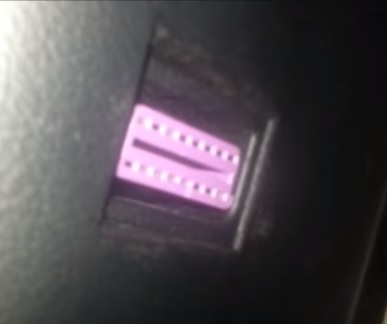 It is a small device so it can always be unplugged and stored in the glove box or similar. 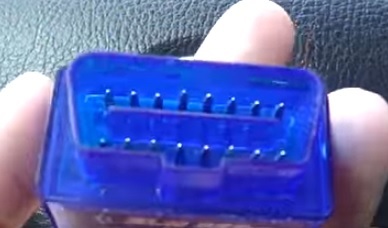 Most all OBD2 port are under the dash, usually it’s under the steering wheel most cars have it directly underneath. After plugging in the scan tool the car can be turned on and should be ready to talk to smartphone. The most popular app is the Torque Pro app for smartphones but there are others. The PRO version cost money but there is free version that will do all the basics from reading codes to clearing them. 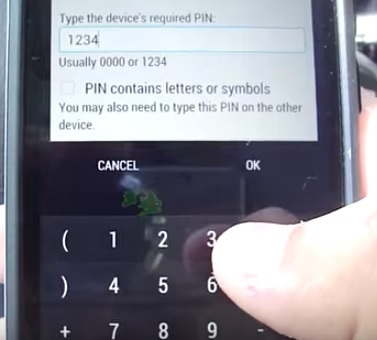 First the phones Bluetooth needs to be paired to the device with the password 1234. The top portion of the app shows us what’s connected including Bluetooth and GPS. The adapter and app work well together and know when the phone app is connected and knows that the adapter is connected to the cars computer. It’s will try to registering the car profile if it doesn’t show up automatically you have to ensure the profile yourself by going into the menu vehicle profile. 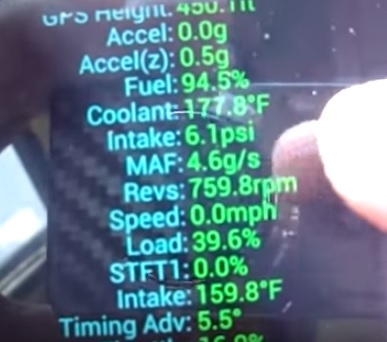 In this example the Mazda 6 has a 2.3 liter four cylinder engine so the weight of the car can be added so it knows when traveling and calculates the miles per gallon that it’s using. 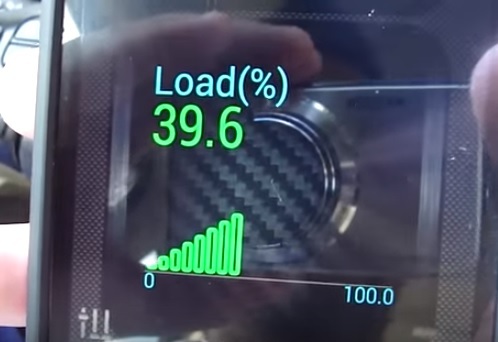 The GPS must be activated on the phone to use this feature and calculate the gas millage. The main screen of the app lets you check faults and clear them if needed. Real-time information is also available. The Map view will keep a log and history of where the car has been. Track Record is something installed after the fact it doesn’t come with the app but it’s free. It’s really cool if you take long trips and you want to record your progress. 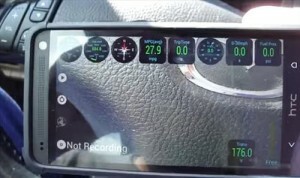 It show and records things such as your direction, miles per gallon, speed, fuel pressure, Revs and so on. It can be configured, or if you don’t want it you can just delete it. I added cities which are customized and also record. For example let’s say that you are traveling a lot like me. I live in Waco and do a lot of traveling to Austin or Dallas and about half way I get pulled over by a cop that says I was going you know ninety miles an hour, but I know that the speed limit is 75 in that I didn’t go even a mile over that. So how do you prove that? You contested in court can you show them this video that it uses both GPS and your phone’s accelerometer to calculate your speed. 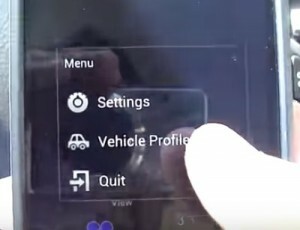 The screen menus are all customizable with a widget area. They can be added for easy viewing such as engine load. As you can see my engine load is a little higher than normal usually what I’ve heard is that at idle it should be between 15-20 percent but here the A/C was on so that may be the factor. A phone mount in your car is ideal for placement since you can easily see what the car is doing with a quick glance. The data is transferred fairly quickly through Bluetooth. If you’ve got a check engine light that stays on you can see what the problem is which is invaluable information. Even if you dont do any repairs yourself and need to take your vehicle to the shop you can see what the problem is and by searching online get a good idea what to expect. Sometimes a problem is simple for example a gas cap that is missing will cause a engine light to come on which this tool will show. Having information about what you car is doing will no doubt help you know if the mechanic is being dishonest about the problem. Seeing the stats on the car is also invaluable as to how many miles per gallon are being used on a trip or daily commute. Often with this information better planing can go into a commute that save money long term. 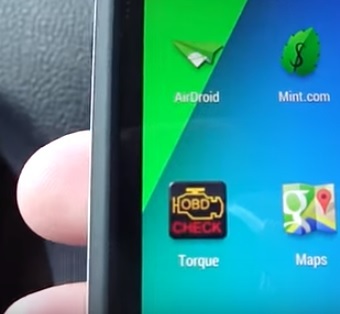 Having a OBD2 Bluetooth scanner tool combined with a smartphone is more than awesome. It gives you tons of information locks it to your profiled which can change from car to car. Yes, you upload the app to your phone or tablet, probably a very big tablet would be beneficial for the eyes, then locate the speed limiter and wack it with the app until it stops limiting your speed. The app maybe removed once this has been accomplished. Hi, I have a speed restrictor on my Ford Transit van, can this device remove that?